Welcome to the Cozumel all inclusive resorts and vacation packages review. A place to find great an all inclusive deals on one of the world's best resort islands and minutes from the legendary Palancar Reef. TIP: Use the TripAdvisor map of Cozumel for family friendly resort prices, ratings, attractions, restaurants, and things to do. Find out the best times of year to travel to Cozumel. Enjoy our list of the top Cozumel all inclusive resorts and things to do. The 200 room Palace all inclusive resort in Cozumel is favored by families and couples alike and has two huge swimming pools, including an infinity pool. The kiddy pool is only the start of what is an impressive line up of amenities and activities for kids. All this attention to the kids may give you the impression that this is not really a place for a honeymoon or romantic vacation, or dive vacation but this is not the case. There are plenty of spaces, attractions and amenities around the resort for everyone. Shows are performed nightly and the all inclusive packages include lots of things to do down on the beach as well. Location: 10 minutes from Cozumel’s airport, 15 minutes from downtown San Miguel. Amenities: Outdoor infinity and splash pools, a swim-up bar, a kid's club. Variety of International, Oriental, Italian and Mexican cuisines. Reviews: Guests simply cannot fault this resort. Usually with an all inclusive you get a few complaints about the food. Not here. The location on the beach is awesome and it puts guests in a great mood. Guests are in a stupor trying to describe how good this one is. Let's see how it goes when it gets a little older and see if it survives the test of time before we give it the crown as the best in Cozumel. All inclusive includes: fine dining, snacks, top shelf drinks, 24 hr. room service, non-motorized water sports, entertainment all taxes & gratuities, wireless Internet. Rooms: 175 rooms in colonial / Mexican decor. Spacious junior suites (all rooms) have a double Jacuzzi, all the regular five star room facilities, ocean views, probably a hammock, nightly turn-down service, and bathrobes with slippers. Non-smoking rooms available. 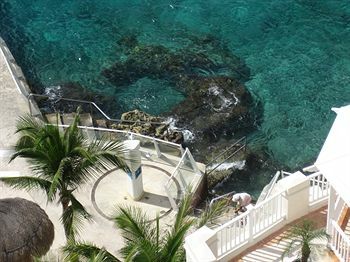 Located right on magnificent Sand Francisco Beach Allegro Cozumel is a stunning looking resort. Packed with beach activities, exotic bars, restaurants, and with good access to diving from the dive shop this is good resort to make the most of Cozumel's natural beauty. For the kid’s there is a multiplay covered playground, water park and dedicated Kids clubs. Sunscape have really geared themselves towards family vacations of late. The Unlimited-Fun packages are central and focused around quality accommodation with balconies and kids amenities. 24 hour access to dining options which are both buffet and a la carte with healthy options available. Beverages in the packages are mostly limited to local and some international label soft drinks and natural fruit juices. The kids club has a couple differentiated age levels for "tweens and teens". Live entertainment, pools and resort activities. The spa also has a range of body treatments and services available. The resorts has about 100 rooms. 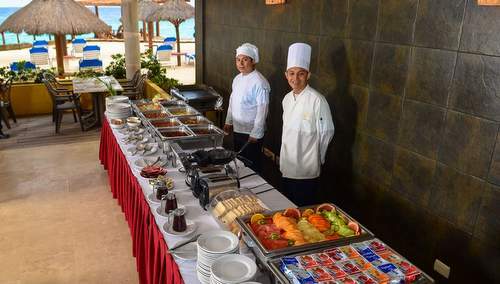 Playa Azul offer a range of all inclusive vacation options which include freshly prepared meals and good choices each and every time. Click the link above for more on this resort. A top way to contain costs (which really are a not excessive in Cozumel) and to find a relatively inexpensive vacation is to check out the best all inclusive Cozumel resorts. 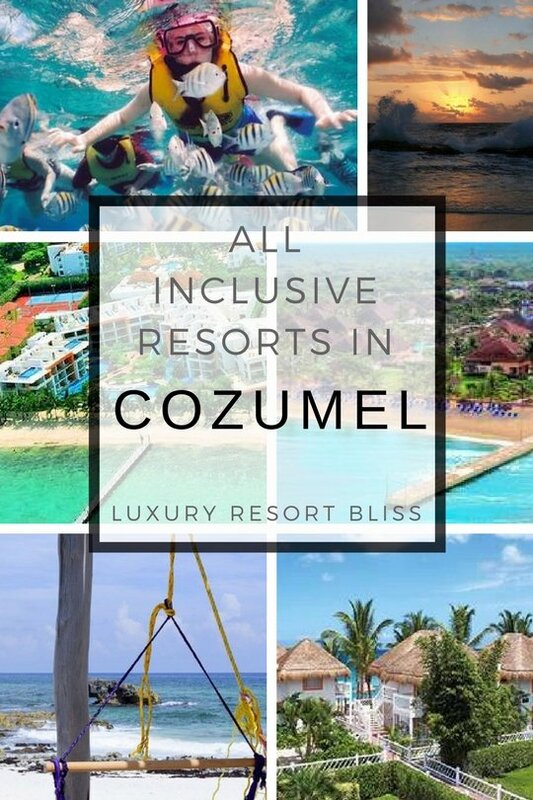 The video playlist below features the resorts from the Cozumel all inclusive resorts bliss list. 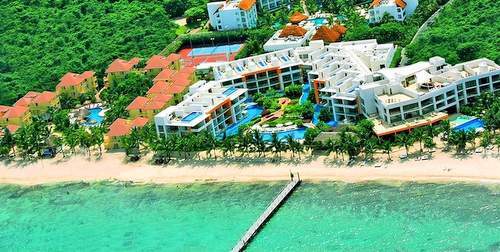 El Cid La Ceiba Beach offers a variety of Cozumel vacation package and hotel deals. With only 60 guestrooms this small resort on the beach with restaurants, full spa and a few other selected activities is able to put together some great little packages, especially for those looking to enjoy a dive vacation.